Jusuf Nurkic is a Bosnian professional basketball. He plays in the center position. He currently plays for the Portland Trail Blazers of the National Basketball Association (NBA). Before joining NBA, he played professional basketball for Zlatorog Lasko, Union Olimpija, Cedevita Zagreb, and Zadar. He was selected by the Chicago Bulls in the first round with the 16th overall pick in the 2014 NBA draft and was traded to the Denver Nuggets where he played for 3 seasons. He also represents the Bosnia and Herzegovina national basketball team. He has over 371k followers on his Instagram. 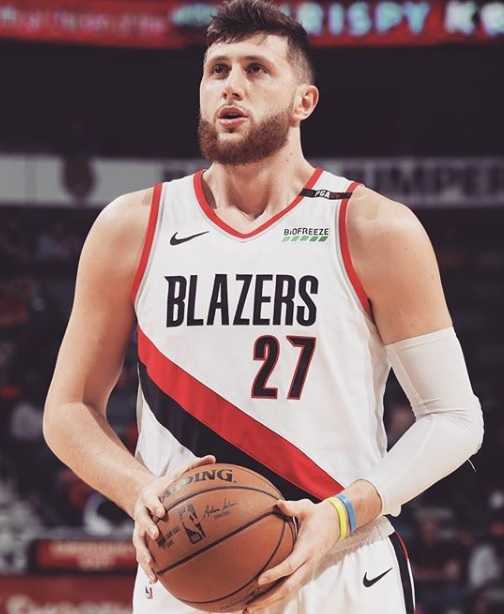 Yusuf Nurkic of the Portland Trail Blazers is out for the rest of the 2018-19 season after suffering a compound fracture on his left tibia and fibula during the second overtime against the Brooklyn Nets on 25 March 2019. The Trail Blazers won 148-144 against the Nets. In a team press release by the Trail Blazers, they stated that he has no expected return date. Before getting injured, he posted 32 points and 16 rebounds against the Nets. The injury of Yusuf who's having the best season of his career might be costly for the Trail Blazers. 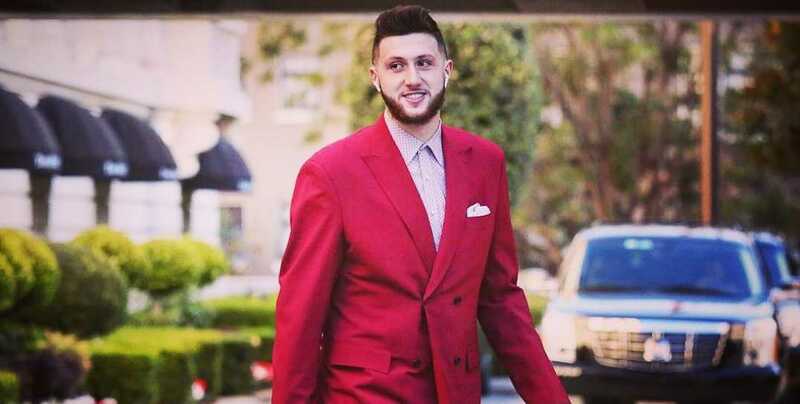 What is Jusuf Nurkic Famous For? Winner of Croatian Cup and Croatian League Finals MVP in 2014. Jusuf Nurkic was born on 23 August 1994. He was born to a father, Hariz Nurkic. Information about his mother is not available at present. His birthplace is in Tuzla in Bosnia and Herzegovina. He holds Bosnian nationality. He has a brother named Kenan Nurkic. He started playing basketball at the age of 14 after Bosnian sports agent Enes Trnovcevic took him to Slovenia and gave him an opportunity to play basketball. There, he played in youth categories for Slovenian team, Zlatorog Lasko. He was briefly loaned to Union Olimpija in February 2012 to play the Nike International Junior Tournament in Belgrade. He gained international attention after he recorded 18.8 points and 11 rebounds in 5 games. After the tournament, he parted ways with the Slovenian team, Zlatorog Lasko. He started training with Croatian team Cedevita. Following a few months training with Cedevita, he signed a four-year deal with the club in October 2012. He told in the press-conference after signing the contract with Cedevita that he parted ways with Zlatorog because his former coach at Zlatorog did not give him the chance to play. He played fewer minutes in the new team under head coach Aleksandar Petrovic in his first season. He played only 6 games in the Euroleague averaging 1.8 points per game. He was loaned to Zadar in January 2013 until the end of the season. In his second season, new head coach Jasmin Repesa he got more playing time at Cedevita. He averaged 11.6 points and 5.6 rebounds per game in the regional Adriatic League. He posted those stats spending only 16.3 minutes on the court. He was nominated for the FIBA Europe Young Player of the Year Award in 2014. Chicago Bulls selected him with 16th overall pick in the first round of the 2014 NBA draft. He was later traded to the Denver Nuggets on the draft night. He signed a rookie scale contract with the Nuggets in July 2014. He made his NBA debut in an 89-79 win over the Detroit Pistons in October 2014. He recorded 5 points and 7 rebounds in his debut NBA game. He recorded his first career double-double with 10 points and 10 rebounds in a loss against the Chicago Bulls in January 2015. He was named a participant in the 2015 Rising Stars Challenge as a replacement for Steven Adams of the Oklahoma City Thunder. But, he declined to play in the event for personal reasons. He scored a season-high 17 points in a loss to the Golden State Warriors in the final game of the season in April 2015. He underwent successful surgery to repair a partially torn left patellar tendon in May 2015. The Nuggets exercised their third-year team option on Nurkic's rookie scale contract and extended his contract through the 2016-17 season. He scored a career-high 21 points in a 102-98 win over the San Antonio Spurs during the 2015-16 season. He scored a career-high 23 points in the 2016-17 season opener 107-102 win over the New Orleans Pelicans on October 2016. He recorded career-high 18 rebounds in a 105-102 loss to the Toronto Raptors in November 2016. The rise of Nikola Jokic, Nurkic was demoted to the bench. He requested the team to trade him twice. The Denver Nuggets traded him along with the rights to the Memphis Grizzlies' 2017 first round draft pick in exchange for Mason Plumlee in February 2017. He made his Trail Blazers debut against Utah Jazz. The Trail Blazers lost 111-88. He scored career-high 28 points and 20 rebounds in a 114-108 win over the Philadelphia 76ers in March 2017. He became the first NBA player since Charles Barkley to post at least 28 points, 20 rebounds, 8 assists, and 6 blocks in a single game. He scored a new career-high 33 points in a 122-113 win over the Denver Nuggets in March 2017. He was ruled out for the rest of the regular season with a non-displaced fracture in his right leg. He returned to the court in Game 3 of the Trail Blazers' first-round playoff series against the Golden State Warriors on 22 April 2017. The Trail Blazers lost the playoffs 4-0. He extended his contract with the Trail Blazers in July 2018. He became the only player in NBA history to post 24 points, 23 rebounds, 7 assists, 5 blocks, and 5 steals in a single game when he posted this stat in a 113-108 overtime win over the Sacramento Kings on 1 January 2019. He became the third player in NBA history to post 11 points, 11 rebounds, 8 assists, and 6 blocks in fewer than 30 minutes in a single game, which he posted in a 127-96 win over the Charlotte Hornets on 11 January 2019. He posted his first career triple-double with 10 points, 10 rebounds, and 10 assists in a 129-112 win over the Cleveland Cavaliers on 16 January 2019. During the match against the Brooklyn Nets on 25 March 2019, he suffered a compound fracture on his left tibia an fibula. He represented the Bosnia and Herzegovina national basketball team at the FIBA Europe Under 18 Championship Division B in 2012. He averaged 19.4 points, 13.3 rebounds per game earning the MVP of the tournament. He was also named MVP of the FIBA Europe Under 20 Championship Division B in 2014, where he averaged 21.4 points and 12.0 rebounds per game. He was the member of the Bosnia and Herzegovina senior team during the FIBA EuroBasket 2013 qualification. However, He did not make the squad for the final tournament due to the conflict with the board of Bosnian National Basketball Association. He averaged 19.2 points, 13.5 rebounds, and 1.0 blocks per game during the Eurobasket 2017 qualification. Who is Yusuf Nurkic Dating? Yusuf Nurkic is unmarried. However, he is not single. He is currently dating Emina Duric. He is more focused on his NBA career. How Tall is Jusuf Murkic? Jusuf Nurkic stands at a height of 2.13 m i.e. 7 feet tall. He has a body weight of 275 lbs i.e. 125 kg. He has an athletic body build. He has dark brown eyes and his hair color is black. What is Yusuf Nurkic's Net Worth? Playing basketball is his major source of income. He is one of the major stars for the Portland Trail Blazers. His annual salary at the Trail Blazers is reported at $11,111,111 for the 2018-19 season. As of 2019, his net worth is estimated at $16 million. His father is a 7 feet tall police officer in Bosnia and Herzegovina.